My first foundation brush was from the body shop and I ”stole” it from my sister. It was a flat foundation brush, and although it was well made it didn’t really work for me. Fast forward a few years. I have a variety of foundation brushes for different types of foundation and the coverage I want – full, medium or sheer. I realize not everyone is as make up obsessed as I am, and it is difficult to choose from the million and one foundation brushes available. Then add on the different foundation formulas and the finishes and it all gets very confusing. This is where I come in, here I will describe the different brushes, the coverage and finish to expect with each one. I tend to switch between brushes depending on the foundation I intend to use and how much coverage I want on the day. You must have seen those squat short brushes with tightly packed bristles that is a Kabuki brush. They work best for buffing in powder foundation into the skin but can also be used for liquid in a pinch. Like other brushes the, bristles may be synthetic or natural. However, the brushes with natural bristles pick up more product and can provide more coverage if needed. The brush should be used in small circular motions to ensure the product is evenly distributed with no streaks on the skin. Kabuki brushed are best used with powder foundations for a sheer finish. 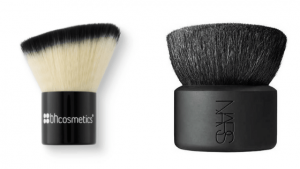 You can try the NARS kabuki brush or the less expensive IT cosmetics Kabuki brush, both very good at what they do. This is one of the more popular foundation brushes and was made mainstream by the MAC 187 brush. The bristles of this type of brush is made from 2 different fibres with white longer and shorter black bristles at the base, hence the name. 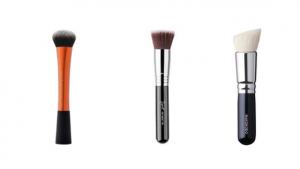 The brushes vary in size and shape but the mid-size is the most popular for application of foundation. The longer thinner bristles distribute liquid foundation evenly for an airbrushed finish. Simply dot product lightly on your face and blend from the centre of your face outwards. Making sure to use circular motions so there are no harsh lines. You can also use stippling brushes with BB, CC creams as well as to apply cream blush or blend contours. They give a natural, light ‘wash’ of foundation rather than a full coverage finish. The real techniques stippling brush and IT cosmetics and NYX duo fibre brushes are affordable and effective. 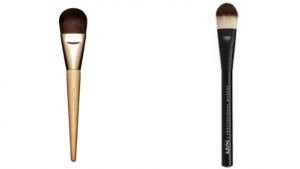 These are the oldest version of the foundation brush and the first type of brush I used. Flat foundation brushes are shaped like paintbrushes and are used exactly in the same way. By literally ‘’painting ’’ the foundation on your face. They provide a full coverage and works best with liquids and creams and are usually tapered at the tip. This allows for precise application especially around harder to reach areas like around your nose and eyes. The synthetic bristles also work well with liquids and thicker creams for a smooth full coverage finish. For seamless application start from the centre of your face moving outwards to your hairline. So that you don’t have the dreaded demarcation line at your hairline. Buffing brushes are similar to stippling brushes but have denser more closely packed bristles so it is easy to use if you are a beginner. They are best for powder, liquid as well as cream products for a lightweight, airbrushed feel. Buffing brushes vary in shape but are typically dome-shaped or flat-topped. The flat-topped brushes have bristles of the same length, the fullest coverage and work best with liquids or creams. 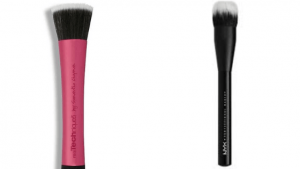 Dome-shaped brushes are the same but can also be used for powder application. The foundation should be applied using circular motions starting from the centre of your face, ensuring just the tips of the bristles touch the skin. The densely and firmly packed bristles on the dome-shaped and flat-topped brushes make it easy to buff cream and liquid foundations onto the skin and prevent streaks from occurring. The domed head is better for the nooks and crannies of your face and diffused foundation perfectly. Some options are the Real Techniques Expert face brush, Sigma F80 and Hakuhodo G557 Brush which vary in price. 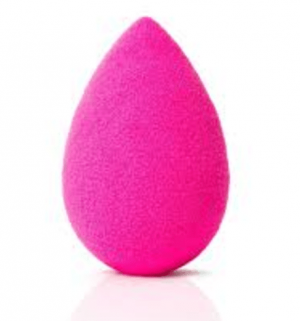 This little pink sponge is a staple for makeup application and has spawned a multitude of copycats some more successful than others. However, the original beauty blender still reigns supreme because of its softness and malleability when moistened. Trust me I have used a number of knock-offs it’s not worth it. Makeup sponges like the beauty blender work best with liquids, creams or stick foundation and given full coverage with a natural finish. The trick with the beauty blender or its imitators is to dampen the sponge prior to use. The rounded shape unlike traditional makeup sponges with sharp edges prevents streaks giving an airbrushed finish. So what do you think? which of these foundation brushes do you use? my favourites are the flat-topped kabuki and the expert face brush. Let me know in the comments and share your favourites. I feel like I have so much to learn – I must confess that beauty and make up has never been my strong point. I own a beauty blender but am still yet to use it.. one day! I appreciated all of the info in your post! I need to show this to my daughter. She’s better with make up than I am! I rarely wear it. I definitely need to brush up on my make-up knowledge – pun intended 🙂 I have always wondered about all of the different options without really knowing what they were for. I have been using a little sponge when applying foundation, which is very rare… but I never liked the sponge. Maybe i should upgrade to a nice brush! Thanks for the tips! I never knew this about makeup brushes. I think I need to get some new brushes so I can get my makeup on right. This is an interesting post, sometimes it can get so confusing when there are so many choices out there, this is a wonderful post to help people get to grips with what is right for them. I use my hands to apply foundation when I’m in a hurry, much to the horror of my daughter’s who have all the brushes and beauty blenders. I do like my beauty blender for dabbing on concealer on the eye area though. I think I’ll give a buffing brush a try next to see if I like the results better than I did with my flat foundation brush. 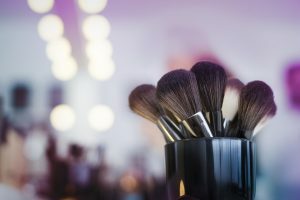 I often wondered about foundation brushes. I have one but find myself using my fingers most of the time. I will have to give it a try. Thank you. I didn’t start wearing makeup until I was 30. And that’s only because I started working in retail (doing makeup). I had no idea what the brushes were used for. so, information like this will definitely help others. I’ve used so many brushes for my foundation and none just never ever pleased me. I tried the beauty blender and for some reason I didn’t like it, so I tried the eco tools beauty blender and it works like a charm for me. I’ll have to look into the brushes you recommended maybe it will change my mind. I recently bought a beauty blender and not really sure if it. This article gives great info and inspires me to give it a go! Until last year, I was still applying makeup with my fingers. I had no idea there was any other way! I now use a makeup sponge, and I’ve heard that foundation brushes are great as well. I wish I had known sooner! They are so much better and less messy as well ! This is a very informative post. Will be taking a leaf or two out of your suggestions. The different brushes for different uses make all the difference. This was helpful to me. I’ve been using powder foundation and want to switch to liquid but didn’t know the kind of brush I would need. Currently I use a buffing brush for my powder and a beauty blender for my B&B cream. I love both of them. I hope I will like the kabuki brush for my liquid foundation. I am happy this was helpful, i use a liquid foundation as well and use a buffing brush the real techniques expert face brush works like a dream and is not expensive. I have to admit my knowledge of beauty is very low so I was not even aware that there were different brushes for different coverage! thank you so much for the tips! I’ve always been curious of which brush should be use for which.. this made things clearer to me. I didn’t realize that I actually have a couple of brushes that are all in this post and that I could use them for their particular purpose, now that I’ve been enlightened by their usage! The beauty blender has become a really musthave, eh? I’ve been seeing it through youtube vids especially when applying the first coat of base on the face. Thanks for all this! This really made me want to clean all my brushes and actually put them to good use! I love using brushes and once you get started using yours you will wonder why you didn’t get started earlier! Haha! I also stole my first foundation brush from my mom: it was a kabuki brush. But at the moment, I’m loving the beauty blender so much. I really need a new set of brushes. I use on eyes mainly though and never used for foundation application. I have seen a few people online doing it though and it looks like a great way to do!. I ned to investigate! Thank you a bunch for sharing this with all folks you really recognize what you’re talking approximately! who you are but certainly you’re going to a famous blogger if you aren’t already 😉 Cheers! Thank you ,i am happy you enjoyed the post !